Staff counting the Carrick votes. Turnout in the Ayr, Carrick and Cumnock seat is 65 per cent from a total electorate of 71,241. That represents a drop from 71.5 per cent turnout in the last general election in 2015. There were 15,464 postal votes and 359 proxy votes. Sources at the count say the result may be close between SNP and the Conservatives. The verification stage of the count is now complete and the count has now entered its final stage. 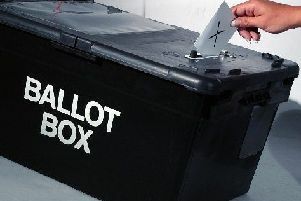 In the Central Ayr constituency there was also a 65 per cent turnout with 13,305 postal votes and 276 proxy votes.